The Detroit native started bowling when he was 12 years old. At 16, he had a 191 average in a Detroit All-Star league. 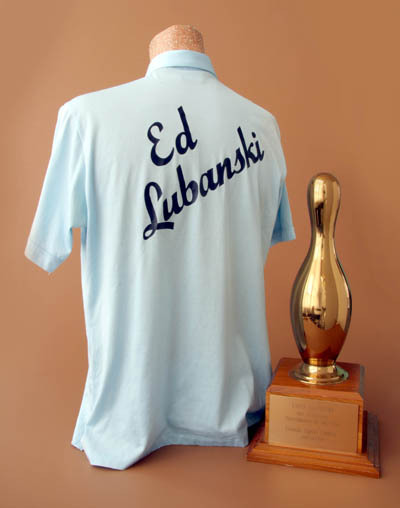 Lubanski won the world invitational crown in Chicago in 1958 and followed up with four titles in the 1959 American Bowling Congress tournament in St. Louis. He was “Bowler of the Year” in 1959 and named to the All-America Bowling Teams in 1958 and 1959. Lubanski posted 11 sanctioned 300 games, including a pair back-to-back on a live TV show in Florida. His lifetime ABC average was 202. Edward Anthony Lubanski was born in Detroit, Michigan on September 3, 1929, the only child of Josephine and Edward Lubanski, Sr. Following in his father’s footsteps, young Eddie started to bowl at the age of 12 and at age 14, he was carrying a 155 average in his first league season. By the time he turned 16, he was making his mark in Detroit All-Star action with a 191 average. One year later, he signed a pro contract to pitch baseball in the St. Louis Browns minor league system. After three seasons, Lubanski decided to make bowling his full time career. Eddie’s initial big-time success came in the Central States tourney taking the all-events title in 1949 with a sizzling 2081 total. The next year, Lubanski teamed with veteran Sarge ‘Ed’ Easter to win the BPAA Doubles. This was the start of his meteoric rise in the game of ten pins. Lubanski’s two-finger, semi-roller bowling ball in a five-step delivery began to show monetary results along the bowling tournament trail. He won the World’s Invitational Championship in Chicago in 1958, then followed that with an amazing four titles in the 1959 American Bowling Congress tournament at St. Louis, including a record 2116 pinfall in the all-events. He was voted Bowler of the Year in 1959 and named to the All-American Bowling Teams in 1958 and 1959. Eddie captained the Detroit Thunderbirds to the championship in the National Bowling League as he rolled the NBL’s first 300 game and was among the top average leaders with a 212 mark. In all, Lubanski posted 11 sanctioned 300 games including a pair of back-to-back 300s on a live television show in Miami. Lubanski’s lifetime ABC tournament average for 29 years was an amazing 202. Lubanski is a man of his words. In 1961, when Fresno, California fans became unruly and excited as the Detroit Thunderbird captain rolled his eighth consecutive strike in the National Bowling League match, Ed went to the public address announcer and asked him to tell the fans to stop the unsportsmanlike ruckus. “Tell them if they want to see a 300-game to please be quiet,” added Lubanski. There were some random remarks and dirty looks aplenty before the crowd complied. Eddie, true to his word, came through with the four remaining strikes to complete the NBL’s first 300 game. The historic perfect game was worth 10 bonus points and a match point to propel Detroit to a 29-28 win over Fresno, under the NBL scoring system.